A UPC number can have multiple listings on Amazon.com. For example, a 6-pack of Coca-Cola and a 12-pack of Coca-Cola may share a UPC despite being differently packaged products. Depending on what mode you’re in you may or may not be able to view multiple listings for the same product. Database search: The app can only show one listing. Live search: The app is able to show multiple listings for the same UPC number. Non-media items have a higher chance to have multiple listings. We recommend sellers who source non-media items to upgrade to Professional plan, so you can use live search to check if the UPC number has multiple listings or not. 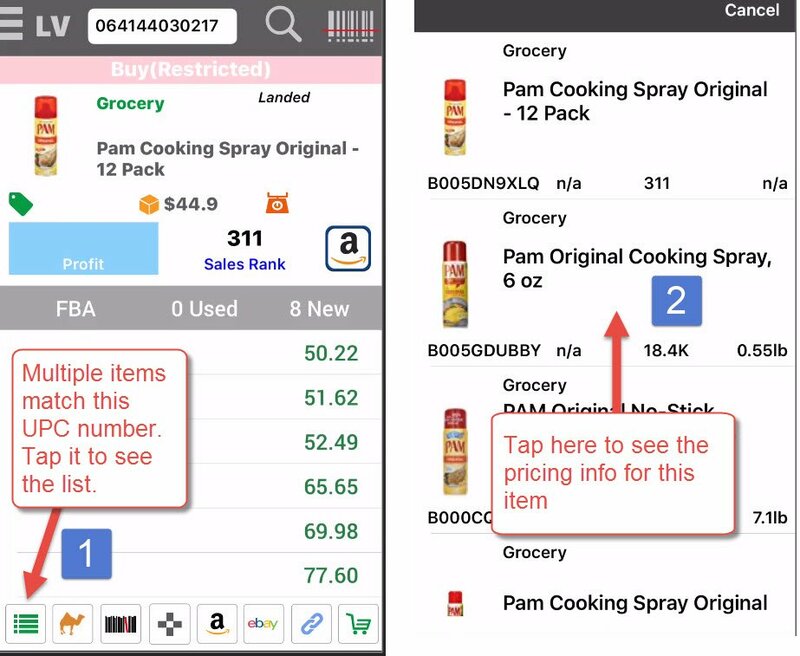 When the UPC number has multiple listings, the app will show the multiple lists icon (1) and you can tap it to see the list. You can tap any item from the list (2) to see its information.